That depends: What do you know about Canadian dividend stocks? Earlier this summer, I wrote an article about how, for the right type of investor, a mortgage REIT like Annaly Capital could be a useful investment if you understand the risk/reward trade-offs and are willing to deal with substantial volatility: in terms of share price, profits generated by the company, and dividends returned to you as the investor. The implicit assumption in all of that is this: you truly understand the business of Annaly Capital. My guess is that for the majority of readers on the site, the write-up on Annaly should go into the “that’s nice, maybe later” file and never seriously pursued after that. Why did I mention it then? Because my schtick on this site is that I talk to you all like adults, and you get to make your own decisions on what you consider intelligent behavior. Benjamin Graham was probably right when he said, “More money has been lost reaching for extra yield than has been lost at the barrel of a gun.” But still, there could be some times when it makes sense to look to Canadian companies to round out your income portfolio. Take something like Enbridge Partners. It has paid an upwardly moving dividend for six decades running (which is wildly impressive given the volatile nature of commodity swings), which has grown every year since ’96 and has grown at a 13% clip in the past decade. 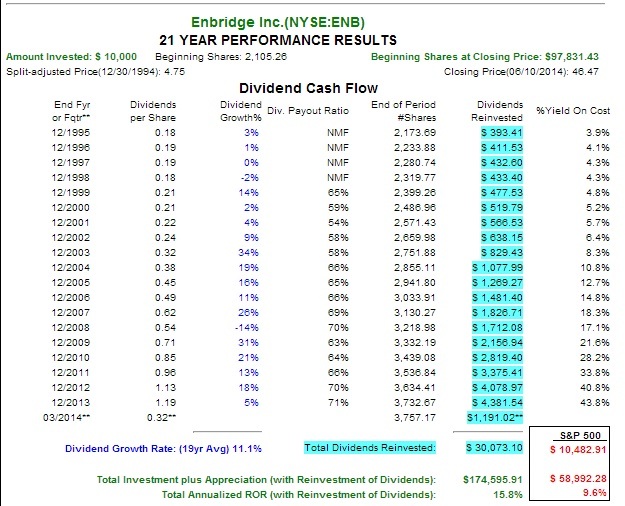 Over the past twenty years, Enbridge has paid out a total of almost $2 in dividends for every $1 that you may have invested, and if you had chosen to reinvest your dividends along the way, the results go haywire as the income continuously compounds upon itself to give you $3 in total income for every $1 invested. Your wealth would be compounding very healthily at a 15% clip so that you would now be collecting over 43% in annual income from your initial investment as a reward for putting aside the capital to invest and dutifully reinvesting for eighty quarters in a row. If you can get your hands on the capital to make a few $10,000 investments in your lifetime, that is all you need to transform your life. Part of the appeal of Enbridge is that the management team is clear about what they are trying to do. They seek to pay out 60-70% of earnings generated as a dividend, and they do it in a generally upward way (so that you don’t feel the full effects of the business cycle). Very few management teams have the courage to lay out the terms like that, and it’s refreshing to see. In tough years, the increase might be small as the earnings payout hovers near 70%. And in good years, the increase will be a little bit lower than the advancing profit growth so you can get the payout ratio down to the 60% range. That’s a solid stewardship, and sometimes you have to go to Canada to get it. Another reason why folks might look to Canadian dividend stocks is because they conclude that American banks are a mess (personally, I think the financial side of an investment portfolio can be fully satisfied by stocking up on some of the following: Visa, Mastercard, Discover Financial Services, Wells Fargo, JP Morgan, US Bancorp, and M&T Bank because those companies possess economies of scale and generally entrenched business models that won’t be leaving us anytime soon) and they want to look north to find an intelligent banking investment. I think it falls within the zone of intelligent behavior for an American investor looking for a high-quality Canadian bank. Take something like the Bank of Nova Scotia, Canada’s third-largest yet most internationally diversified bank. That is a company that, once owned, changes your life when it is tucked away in your brokerage account and given long periods of time to grow. Don’t just take my word for it, check out this dividend history of Nova Scotia Bank dating back to 1892. Check out this report of Nova Scotia Bank’s health, starting on page 34. For the right investor, looking to Canada could make sense if you want to make a banking or energy investment, and you already have the pillars of your portfolio constructed and are looking to diversify without diworsifying by acquiring an interest in the best income-producing that Canada has to offer. The Bank of Nova Scotia’s dividend went from 1.92 to 1.96 during the 2008-2009 comparison period—if you solely owned American banks, you probably experienced cuts in the payouts of your holdings unless you were playing it small with regional community banks that seemed to avoid implosion (because they had adequate capital on hand heading into the recession and didn’t have complex trading operations that involved using short-term funds to make long-term commitments that were redeemable at any point in time, and thus, vulnerable to liquidity crises like Lehman and Bear Stearns). To answer the Canada question, I would ask myself this: Are there any Canadian firms that I understand thoroughly? If the honest answer to that question is no, I would stop the inquiry there. You avoid bad outcomes by avoiding the predecessors to bad outcomes, and the easiest way to do that is to stay from things you do not understand. However, if the answer is yes, the question becomes: Do I have a diversified collection of “pillar stocks” in my portfolio that I’m looking to build upon? If you answer that question yes as well, then congrats, you’re ready to begin Canadian dividend investing.